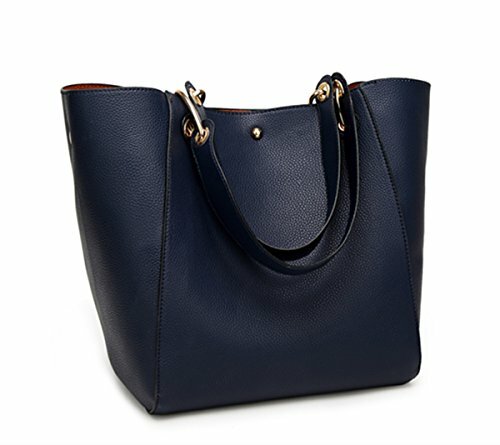 1.This is a gorgeous elegant high-end classic women shoulder bag, you can change the shoulder bag shape by strap. 2.No matter you are a housewife, office lady or a college student, this tote bag is a great choice of you. As it can reflect your honorable identity. 3.Thank you for your positive feedback. If you have any issues, contact us directly before leaving a negative feedback. Thank you. 4.We earnestly promise that we will provide you the highest quality products and the best after-sale services. Please feel free to contact us when you needs help, and we'll contact you within 24 hours . 5.Due to differences between monitor displays, actual color may vary slightly from image. Please allow a 1-3cm measurement error due to the manual measurement. 6.NOTE:Wash it with clean water in ordinary temperature . DO NOT wash it with hot water and alkaline detergent. Hang to dry and store in ventilated place instead of sun exposure. Material:High quality synthetic leather material, waterproof and comfortable. Structure: 1 inside zipper pocket. 1 small inside purse, it can take apart if you like. metal magnetic buckle, thick fastener, comfortable strap(3 pcs). Dimension: 11.4"x11.8"x10.2"/29cmx30cmx26cm(L*H*W)The height of the handbag is approximately equal to the longest side of an A4 paper.The height of the hand strap is 8.66inches(22cm).The height of the shoulder strap is 13.38inches(34cm).Weight is about 1.05kg. Simple fashion look and powerful capacity for everyday or travel use. Excellent bag for using in office, school, traveling or any other daily occasions. Perfect gift choice. And perfect for using as a Mommy Bag.The detachable two hand straps along with one shoulder strap are very convenient to use.